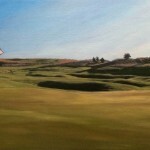 Josh grew up in Urbana, Ohio, home of one of the most well know current golf architects, Pete Dye. From an early age Josh enjoyed golf as part of a family of 3 boys whose father taught each of them the game. From drawing simple course drawings as a child, Josh’s love for courses has been strong. 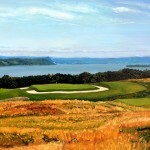 Having been fortunate enough to play many of the great courses by the architects of the past and present, Josh was searching for an additional way to bring golf to others. His love for golf since those early days playing with family remains ever present even today. Josh decided he would turn his love of golf and golf course architecture into something more than just the enjoyment from playing a round. 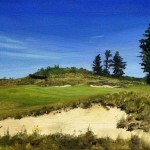 Having an appreciation for fine art and the beauty found on the great courses, Josh decided to take his vast experiences playing golf and convey them on canvas with oil paint. Originally inspired by Sir John Lavery’s The Golf Course, North Berwick, Josh hoped to convey the peace and harmony found only on a course. Josh’s work is all oil on canvas and is done wet on wet so edges are soft and atmosphere of those wonderful courses exudes off the canvas. 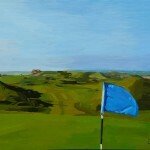 Josh’s paintings tend to show courses from a player’s perspective, and in that way most aptly convey the vision of the architect and remind those who have played the courses the sensory experience from their time on site. 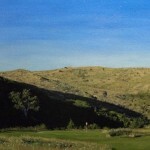 From capturing a beautiful morning round in the Sand Hills of Nebraska to showcasing a family’s love at a course more off the beaten path, Josh is able to capture the essence of a course through oil on canvas beyond what a simple photograph can do. Josh understands that golf is about more than just hitting a ball around a course, but truly a sport that enriches and enlightens all who permit themselves to embrace the spirit of this wonderful game.